By the time period of Star Wars Rebels, the Jedi were in a very bad place (specifically, they were mostly dead). But on the latest episode of the show, “Shroud of Darkness,” their power once again begins to grow....which isn’t necessarily a good thing. Visiting the Jedi Temple on Lothal, Kanan, Ezra and Ahsoka Tano all encountered powerful Jedi. Kanan meets the mysterious temple guard. Ezra sees Master Yoda. And Ahsoka sees her former master, Anakin Skywalker. Their revelations pique the interest of Darth Vader who ended the episode by saying the rising powers of these Jedi would “be their undoing.” He’s presumably right, because we don’t see these characters come A New Hope. Here are a few clips. The episode reveals the temple guard was once the Grand Inquisitor, and that Kanan is now a Jedi Knight; meanwhile, Yoda told Ezra to visit Malachor and Ahsoka finally learns the fate of her master Anakin. 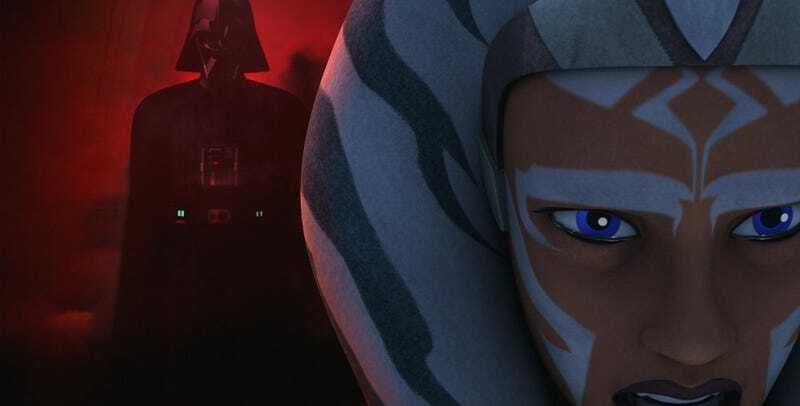 We’ll have to wait and see how each of those revelations will play out as season two slowly comes to an end, But this was an episode of Star Wars Rebels filled with info for fans of the franchise.